Directors Glenn Ficarra and John Requa have carved out something of a niche for themselves by making high-brow, star-centric, concept dramedies that one can't help but to be interested in if over a certain age. With Crazy Stupid Love being something of a breakout after their underrated 2009 debut in I Love You Phillip Morris the co-directors collaborated on writing and directing the stylish if not overly convoluted Will Smith caper last winter in Focus and have now moved on to collaborate with Tina Fey and long time writing partner Robert Carlock for this adaptation of newspaper reporter Kim Barker's memoir, "The Taliban Shuffle: Strange Days in Afghanistan and Pakistan". While I haven't read Barker's book this is one of the few stories I almost feel compelled to go back and read after having seen the movie version. Typically, I like to read any type of source material prior to seeing a film adaptation due simply to knowing where the idea for the film came from and what/why certain changes might have been made to better adapt the material to a different art form, but Whiskey Tango Foxtrot (why they didn't keep the more engaging title of the book for the movie is something of a mystery, especially given I don't recall there being a title card in the film) is something of an aberration in the sense that the film itself is not necessarily what we might expect from a seeming comedy, that somehow was able to get away with an R-rating, and stars one of the more agreeable celebrities of our time. Fey is someone even the most cynical among us can't seem to dislike and so to pair her with directors who have somehow managed to secure solid budgets on thoughtful, adult fare such as this is inspiring and thankfully, worth the endeavor as the resulting product is a well-constructed, nicely measured bit of insight into a set of circumstances not many can identify with making this inside look and the general proceedings all the more engaging and interesting. 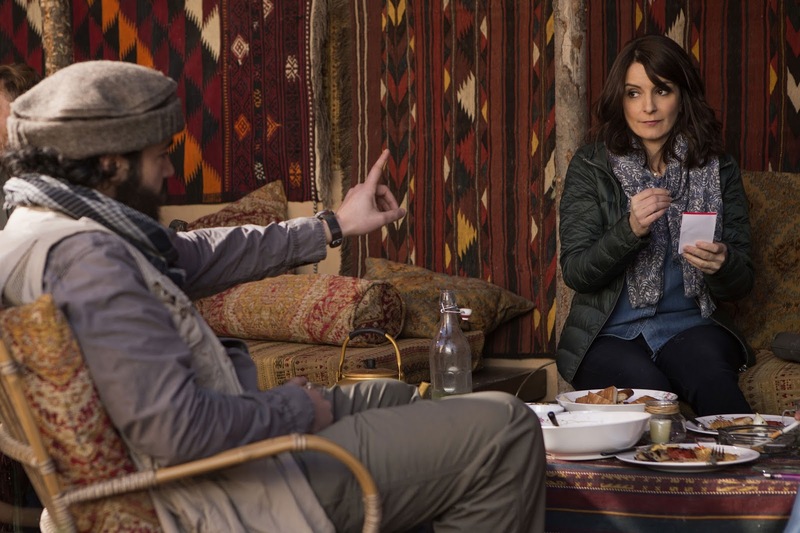 Fahim (Christopher Abbott) teaches Kim Baker (Tina Fey) the expected role of an Afghanistan woman. Barker now has one less letter in her last name as Fey plays a version of the real-life reporter named Kim Baker who volunteered out of a handful of colleagues who also had no spouses and no children to go as a war correspondent to Afghanistan during Operation Enduring Freedom in 2003. Initially intended to be a short, three month stay the film actually begins in 2006 where we are privy to a seasoned Baker who has seamlessly integrated herself into the culture of the area and the small, but loyal group of journalists, reporters, photographers, and security personnel that make up the small compound of non-natives chasing interesting aspects of the ongoing conflicts in the country. Fey's Baker largely commits to such a drastic change due to her dissatisfaction with her life in general. As a transcript writer who occasionally takes on low-profile stories who's in a relationship with a semi-serious boyfriend (Josh Charles) that seems to be heading nowhere her life has stalled. And so, change is needed, but as Baker's time in Afghanistan continues to be extended she comes to experience new insights and realizations about not only the American presence in the area, but herself and the type of role these experiences will play in shaping the person she is still becoming. There are a host of crucial elements involved in lending the film and its protagonist such insights though, the most critical of which being the people that welcome Baker into their humble abode and give her a VIP tour of what life is like for those who don't mind putting their lives on the line for a little bit of airtime. Most significant are noted Australian correspondent Tanya Vanderpoel (Margot Robbie), Scottish freelance photographer Iain MacKelpie (Martin Freeman), and Afghan government figure Ali Massoud Sadiq (Alfred Molina). Almost of more interest though are the relationships Baker develops with her "fixer" of sorts in Fahim Ahmadzai (Christopher Abbott) and an American Marine General (Billy Bob Thornton) that influence both her personal and professional perspective on the present situation she has placed herself in. 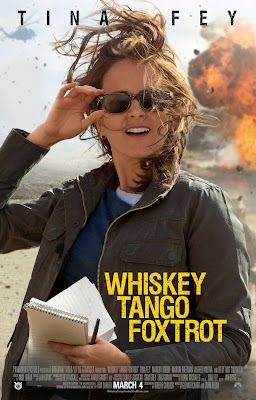 It is in these relationships that Whiskey Tango Foxtrot finds its heart. Otherwise, there is hardly a driving plot device other than the one that is abruptly introduced in the third act and is resolved just as promptly for what seems to be no other reason than to create a little bit of tension for the film to resolve before committing to its denouement. Still, this is more than enough to sustain the film as it has plenty to say given the characteristics of its main players and the backdrop of their story that provides ample commentary and plenty of amusing conversations. Given Fey is a woman who has always been passionate about giving women a strong voice in an industry dominated by Caucasian males one of the clearer objectives here for the producer/actor and likely for the real Barker as well was to highlight the status of women in such regions of the world. Giving a voice to the voiceless, if you will. The first of many challenges in adapting to her new surroundings comes in dealing with the societal expectations of women in Afghanistan. Baker's status as a woman presents many restrictions while also giving way to a few advantages especially in gaining access to women in a village where a US-built well is consistently being damaged the reasoning to which is ultimately unveiled to Baker in a memorable scene that breaks a barrier for both the native women and this unique aspect from which she might approach her stories from. A scene where Fey's Baker hides a camera under a burqa to record an Al-Qaeda-like demonstration is another that illustrates not only how the character utilizes her role as a woman, but also further clarifies how much of a drug the dangerous environment can be. Baker begins to depend on the rush that comes with such attempts to find a good story that her perception of normal begins to warp as well. It is through this conflict that her relationship with Abbott's Fahim takes a turn from someone she works with to someone who truly means something in her life. As Fahim, Abbott is incredibly compassionate with his facial expressions communicating much of the sympathy he garners from the audience. While Fey and Freeman are ultimately the ones who end up in a charming romance, it is the relationship between Kim and Fahim that was giving me all the feels. Tanya Vanderpoel (Margot Robbie) gives Fey's Baker the lowdown on how things work in that part of the world. Sure, Whiskey Tango Foxtrot suffers from being a little too long, some of which is spent meandering and some of which is spent trying to shoehorn in that unnecessary conflict and its resolution, but overall the film works due to its larger purpose of painting a fascinating portrait of a set of circumstances most would never dare allow themselves to be found in. More than this, it pulls out the bigger themes of these individuals' lives and the lessons they learn from being on the ground in Afghanistan at that point in time and applying those to the film rather than attempting to reach for something bigger in hopes of making some grand political statement. Whiskey Tango Foxtrot is a small, but effective feature and while it deals in big issues of the real world, the issues it brings to the forefront are those of the same qualities that describe the film. On the terms of being more of a character study the film inadvertently breaks down the evolving psyche of a character who goes from one seeming normality to another that includes the conflicting ideologies within her that argue over what exactly "normal" means eventually forcing her to face what she sees and evaluates as true happiness and success and setting her sights on those goals so that her ambitions might eventually become a "normal" she's secure in. Ficarra and Requa never state outright how they intend to get at certain themes or ideas, but rather they simply allow the material to breathe and it is from this sense of looseness and freedom that we come to recognize such motifs. Yes, Margot Robbie is nice to look at, but more importantly she further solidifies herself as pure movie star material as her charisma is off the charts here. Yes, you'll surely recognize Tall Brian (Nicholas Braun) from a number of other movies you can't put your finger on and yes you'll likely Google Evan Jonigkeit afterward to see what else the likable, modest actor has been in, but this is Fey's movie and she owns every shot of it from the unsuspecting opening all the way through to the unexpectedly weighty conclusion.